Black-tailed prairie dog, Boulder, Colorado. In June-September 2003, I was fortunate to participate in research on disease ecology in grassland rodents, conducted by Collinge Lab of Colorado University, Boulder. This is an unofficial page about the project. Kissing and hugging are among the most typical forms of prairie dog social behavior. Broomfield, Colorado. Black-tailed prairie dogs, Boulder. 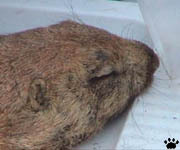 The main focus of the project is the black-tailed prairie dog (Cynomys ludovicianus), one of the largest rodents in the Great Plains of North America. 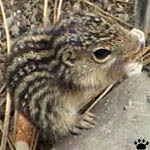 This member of squirrel family is a relative of marmots and ground squirrels. It ranges from Saskatchewan, Canada to Chihuahua, Mexico. 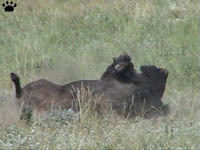 Although the black-tails mostly inhabit shortgrass prairie, they also live in mixed-grass prairie in the east, and in Rocky Mountains foothills in the west. 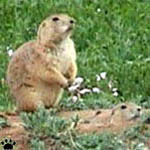 Just 200 years ago their colonies, commonly called prairie dog towns, occupied most of the Great Plains. Larger towns covered hundreds of square miles, and had thousands of inhabitants. 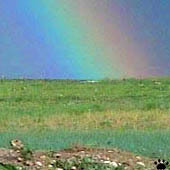 Now large continuous towns can only be seen in places where prairie dogs are protected. World's largest surviving prarie dog town near Janos, Mexico. There are four other species of prarie dogs in the World, but their social structure is somewhat more simple. S. Dakota. 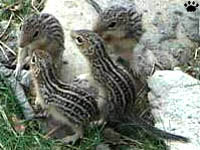 Black-tails are believed to have the most complex social organization among the world's rodents. They have multilevel societies, and highly evolved language. Recent discoveries suggest, for example, that their alarm calls can contain detailed information not only about the species of an approaching predator, but even about the clothing color of an approaching human. Their high adaptability allowed them to survive decades of shooting, poisoning, and habitat loss from agriculture and urban sprawl. Prairie dog in a burrow, Boulder. of bad weather. Boulder. 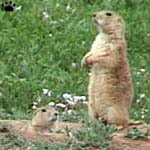 Burrow systems play critical role in prairie dog biology. They have three types of entrances: craters, domes, and simple openings. 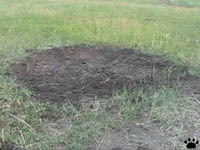 Craters and domes can rise up to 50 cm above ground. They serve as part of an ingenious ventilation system. Even slightest wind makes the air move between burrow openings of different types. Inside the burrows are sleeping chambers, food caches, and toilet rooms. In many parts of the American Southwest, black-tailes were replaced by less social, more desert-adapted Gunnison's prairie-dogs due to overgrazing, deterioration of grasslands, and general aridization. Gallup, New Mexico. predators all the time. Nopo, North Dakota. Prairie dog towns seem to have much less vegetation than surrounding areas. Farmers usually believe that those rodents compete with cattle for pastures. 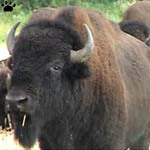 This is not true: cattle, like once bison, actually prefer to graze on prairie-dog colonies. Another popular myth about prairie dogs is that cattle often break legs in their burrows. The truth is, it virtually never happens to horses, and never at all to cows and sheep. 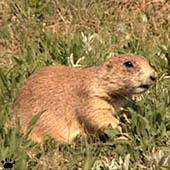 Prarie dogs breed once a year. Pregnancy lasts about a month. sentinel duties at an early age. the age of about 10 weeks. Janos. Black-tailed prairie dog, Boulder. 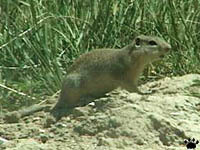 Prairie-dogs are a subject of bitter controversy throughout their range. Farmers consider them pastureland pests, city folks accuse them of spreading disease. Environmentalists point out that prairie dogs improve pastures by tilling and fertilizing soil, and that their presence is extremely important for other prairie wildlife. Common spiders of prairie dog towns: black widow (Latrodectus mactans) and tangerine jumping spider (Phidippus maximus). Nat'l Grassland, Colorado. 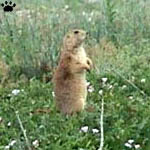 Black-tailed prairie dog is a classical example of what is called keystone species. 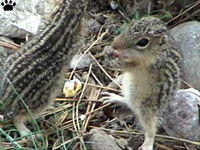 Their towns provide habitat for dozens of animals, from tiny ants and spiders to rare birds and mammals. 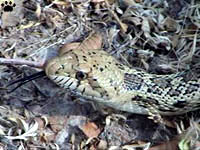 Predators and parasites feed on the rodents themselves, others use their feces, burrows, food caches, or simply prefer shorter grass on the colonies. in semi-desert conditions by using prairie dog burrows for shelter. Wind Cave Nat'l Park, S. Dakota. Southwestern toads (Bufo woodhousei australis) of different ages, Comanche Nat'l Grassland, Colorado. woodhousei). Lyons, Colorado. 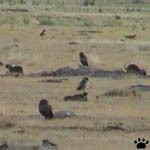 Fauna of prairie dog towns differs a lot throughout their huge range. As you move from north to south or from west to east, you can find different species of shrews, toads, beetles, and rodents in their burrows. Thunder Basin Nat'l Grassland, Wyoming. Of many reptiles living in prairie dog towns, only two large snakes are capable of killing and eating prairie dogs. 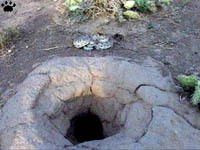 The rodents would often use earth plugs to cut off a part of a burrow occupied by a snake. Mountain plovers on a prairie dog town (left) and on a road. Pawnee Nat'l Grassland, Colorado. Mountain plover chicks on a prairie dog town, Como Bluff Dinosaur Graveyard, Wyoming. Grassland. 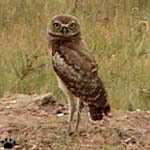 Numerous birds, from robins and magpies to hawks and eagles, frequent prairie dog towns, but only burrowing owls (Athene cunicularia) and endangered mountain plovers (Charadrius montanus) depend on them for breeding sites. In absence of prairie dogs, mountain plovers nest on road shoulders, where only very few chicks manage to survive. 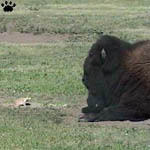 Bison and prairie dog, Wind Cave. Bison family, Custer State Park, N. Dakota. Roosevelt Nat'l Park, N. Dakota. 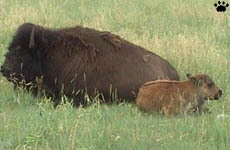 Historically, bison were among the most regular visitors to prairie dog towns. They used them for grazing and wallowing in the dust. 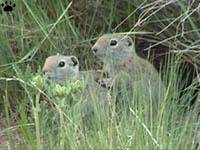 Now their interactions with prairie dogs can only be seen in a few protected areas. 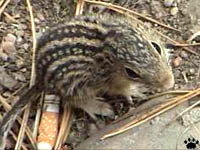 Nowadays, the most common diurnal herbivore co-inhabitants of prairie dog towns are ground squirrels. Pronghorn and deer also graze there occasionally. 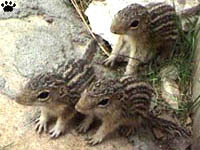 Young thirteen-lined ground squirrels (Spermophilus tridecimlineatus), Ogallala, Nebraska. Sangre de Cristo Mts., New Mexico. At night, the most commonly seen mammals of prarie dog towns are jackrabbits (Lepus), cottontail rabbits (Sylvilagus), and various small rodents. in a prairie dog burrow, Janos, Chihuahua. American badger(Taxidea taxus)hunting a prairie dog, Oglala Nat'l Grassland, Nebraska. Badger, Thunder Basin. The only predator entirely dependent on prairie dogs for survival is black-footed ferret (Mustela nigripes). 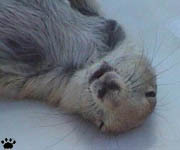 Widespread poisoning of prairie dogs caused its extinction in the wild. Captive-bred ferrets are being reintroduced into parts of their former range, but nowadays it's difficult to find prairie dog towns large enough to support a ferret population. Badger, near Carlsbad, New Mexico. 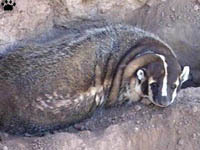 American badger (Taxidea taxus) is now the most regular hunter of prairie dogs. Its thick skin and huge claws are adaptations for digging. It can dig fast enough to capture rodents underground. 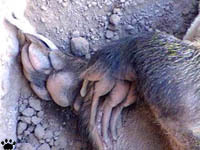 Badger paws (photographed in captivity). Coyote(Canis latrans) hunting a prairie dog, Louisville, Colorado. Reservation, Montana. Coyotes also hunt prairie dogs regularly, while foxes, bobcats (Felis rufus), mountain lions (F. concolor), and feral dogs take them occasionally. Grizzly bears (Ursus arctos), once their common predators, are now extinct almost everywhere on the Great Plains. Hawks (Buteo) are dangerous for juveniles, but the only bird of prey commonly capturing adults is golden eagle. Coyotes on a prairie dog colony, Lyons, Colorado. Boulder. 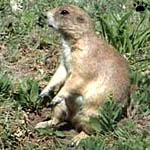 Only one enemy threatens the survival of black-tailed prairie dog as a species: plague bacteria (Yersinia pestis). Since it was accidentally introduced to North America from Asia in the 19th century, it wiped out countless prairie dog colonies. The aim of the project is to better understand the dynamics of this disease in the prairie ecosystem, and, if possible, develop better strategies for protecting prairie dog populations. 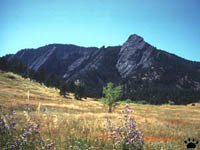 Most of research was conducted around Boulder, Colorado; other field sites were located throughout the shortgrass prairie zone. 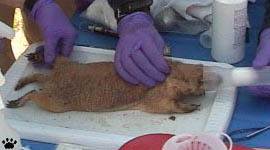 Anesthesized adult prairie dog, Boulder. We captured prairie dogs, collected blood samples and fleas (vectors of plague) to check them for bacteria, inserted microchips for future identification, and released the animals. We also conducted density counts on colonies, behavioral observations, and other research. Anesthesized juvenile prairie dog, Boulder. after anesthesia, but flea-free. Boulder. The project is supposed to run for five years and provide a considerable amount of data. In addition to looking for plague, we also study the distribution of Bartonella bacteria. Its distributional patterns are supposed to be similar to those of plague, but more easy to study, because it is much more common in rodents (possibly a symbiont rather than parasite). Anesthesizing an adult prairie dog. Boulder. 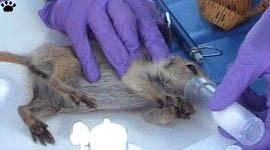 Anesthesizing a juvenile prairie dog. Boulder. Rocky Mountains rising above the Great Plains. Boulder.